Samsung's announcing the Galaxy S IV tomorrow but before it does, Apple wanted to take a few shots at Android. 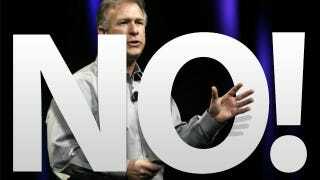 Phil Schiller, Apple's Senior Vice President of Marketing, crapped all over Android telling the WSJ that, "Android is often given a free replacement for a feature phone and the experience isn't as good as an iPhone." "When you take an Android device out of the box, you have to sign up to nine accounts with different vendors to get the experience iOS comes with. They don't work seamlessly together."